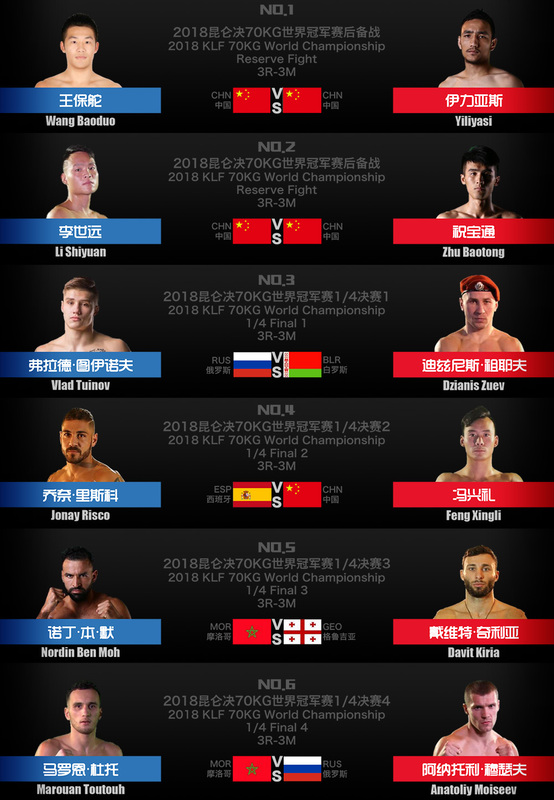 Kunlun Fight "Clash of Titans'' Kunlun Fight 77: "Hollow Throne" is scheduled to go down on Tongling China. The showpiece encounter featured by THE ELITE 8 contend for the converted title. Russian Vlad “Diamond” Tuinov will pit his skills against Former Kunlun Fight tournament champion Dzianis Zuev. Thailand Superbon pulls out the tournament because of the flu, Russian Anatoly Moiseev comes for substitution to square off against much taller Morocco's prodigy Marouan Toutouh. Infusion champion Jonay Risco comes into the contest with a game plan for victory. Former GLORY champion Davit Kiria will take on Morroca powerhouse Nordin Ben Moh.